Now that the World Cup is drawing to an end, it’s time to unleash the Summer Blockbusters and we kick off with another Dwayne Johnson vehicle (does this guy ever stop making movies?) He’s reunited with his Central Intelligence director, Rawson Marshall Thurber, for, what looks like a cross between The Towering Inferno and Die Hard. Only thing is, you should never try to emulate the granddaddy of disaster movies and the greatest action film. This tries but doesn’t even get close and is having to rely on the charisma of its leading male to pull it through. Even that is starting to run a little thin. Will Sawyer is a former war veteran and FBI hostage rescue team leader who had to give up that life after an incident led to him losing a leg. Now working as a security assessor, he and his family have gone to Hong Kong where he has been working on the world’s tallest building, The Pearl. The building comes under an arson attack and Will is the prime suspect. Not only must he find the men responsible but he’s the only man to rescue his family who are trapped in the blazing tower and who are being used as a pawn to blackmail the designer. It’s very hard not to compare this film to the two giants that this so desperately wants to be but both films had elements that this can only dream of ever reaching. Firstly the stunt work. In both The Towering Inferno and Die Hard, the use of CGI to create depth and pure peril were limited. When you saw flames, they were real and you knew that Paul Newman was genuinely clambering down a destroyed stairwell. Most of the time, the characters seem to be surrounded by heavily designed computer generated background and you don’t feel a moment that there is any real tension. For all his wise-cracking, the reason Die Hard works so well is that Bruce Willis’s John McClane gets hurt so the first time you watch it, you do ask yourself will he survive. Sadly for Dwayne Johnson, he never looks like an ordinary guy who bleeds and so you know that he will get through the film, maybe a little bruised but that’s about it. What does this film bring to the table then? Nothing new at all. It tries to give the whole action hero a twist by having him as an amputee with a metal prosthetic leg, which comes in handy when it’s needed to be used as a plot twist but, quite frankly, if we weren’t reminded every so often it doesn’t drive the story on. Those with genuine disabilities may find this a tad insulting. I can understand the idea behind it, wanting to do for disabled what Black Panther did for the black community but if that is the case, what about hiring an actual disabled actor to play the role? This is a film about effects and Johnson. The rest of the cast are there to support them. It’s nice to see Neve Campbell returning to the big screen and apart from a couple of fight sequences (she play a former army doctor who saved Johnson’s life), she is only there to run and to listen to the orders being delivered by Johnson. The rest of the cast are instantly forgettable with the least memorable villain in any action film. Not Roland Moller’s fault, it’s just very badly underwritten. It’s up to Johnson to hold everything together and even he is struggling. The action sequences, as outrageous as they are, with Johnson hanging from every window and, particularly, jumping from a crane into the fiery building are impressive but not exactly tense. 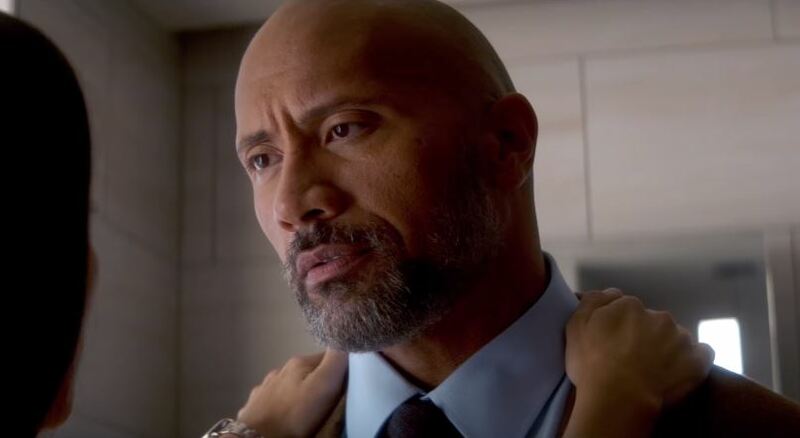 On a scale of where it sits within the past Dwayne Johnson films, it falls way short of the bonkers world of San Andreas and even the lacklustre Rampage had a few moments of wit. 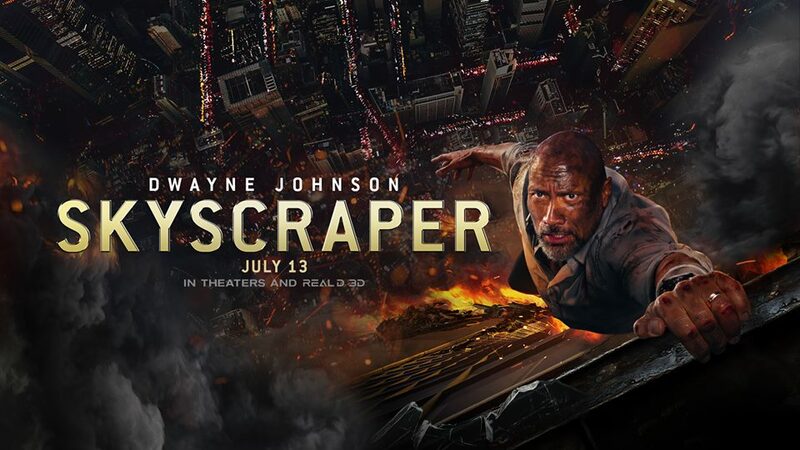 Skyscraper isn’t half as much fun as it should have been and instead of focusing on being the new Towering Inferno and Die Hard, it should have gone for its own voice, allowed Johnson some smart one-liners and had its tongue rammed in its cheek. Instead, it takes itself far too seriously and even at 102 minutes, it drags.